It's only very recently that we featured a full review of Dell's impressive new 23" IPS U2311H screen. This time, we've got a screen which looks very very similar but is 1.5 inches smaller diagonally. The U2211H is the smaller brother of the U2311H with a screen size of 21.5". It retains the appearance, features and options of its bigger brother, and even offers a full 1080 HD resolution. Dell have done a good job recently extending their Premium monitor range, offering the all round performance of IPS technology in every size sector from 20" up to 30" really. We were already impressed by the 23" models performance and extremely competitive price, so we are keen to see whether the same can be said about the 21.5" equivalent. The majority of the images you see here of the U2211H are exactly the same as you will see from our U2311H review and that's because the screens look identical apart from the slight size difference. Dell have kept the same thin black bezel and sturdy black base, with a silver trim from the stand. 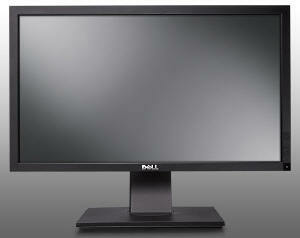 The screen looks pretty sleek and professional and is in keeping with the other recent models like the U2410 and U2711. As with the other screens, the power button is located in the bottom right hand corner, and glows blue in operation and orange in standby. This corner also features the OSD operational buttons. Like the U2311H they are actual 'press' buttons as opposed to the touch sensitive buttons on the 24" and 27" models. These give you access to the OSD menu. Pressing any of them loads up a smaller selection menu in the corner as shown above (left), which guides you as to what each button will then do. There is quick launch from here into the preset modes menu (shown above on the right), and to the brightness / contrast section. 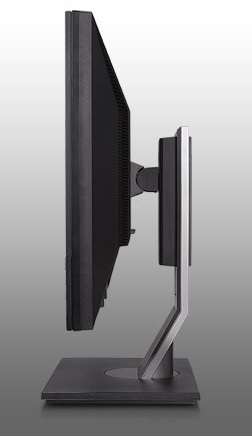 As with the other Premium models, the stand on the U2211H offers a decent range of ergonomic adjustments, with a height, tilt, pivot and rotate function available. The height and tilt adjustments were smooth and easy as they were on the 23" model. 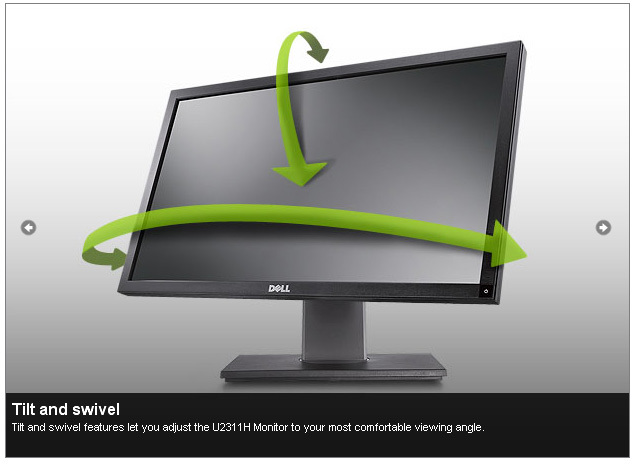 Unlike the 23" model though, the U2211H offers a much smoother and easier to use pivot function which was not too stiff. The rotate function was also a bit easier to move and being a little bit smaller, I felt perhaps a bit more practical. Materials were again of a high standard and the built quality felt good. On the left hand edge of the screen there was an integrated 2-port USB hub which is always useful for connecting external devices. There was no detecable noise from the screen and it remained fairly cool during operation as well. I tested the screen at various brightness settings and there was no issue here. The panel itself features a matte anti-reflective coating which is very similar to the U2410 and U2311H. The underside of the back of the screen offers a pretty decent range of interface options as we've come to expect from Dell's high end screens. 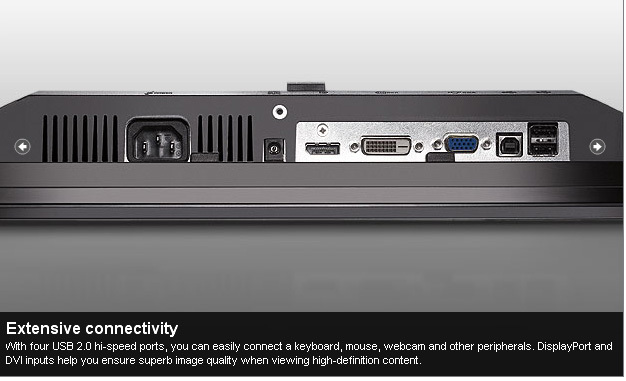 There's a single DVI-D (HDCP supported) and D-sub interface, along with DisplayPort which is fast becoming a popular connection type. 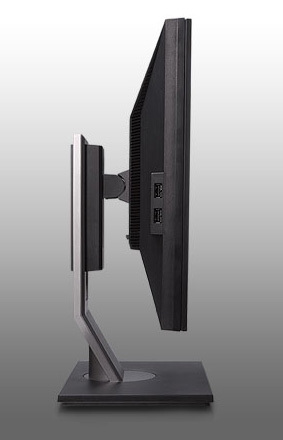 There's also a further 2x USB ports (along with the upstream port to connect the screen to the PC). The screen is missing some of the further connections that the U2410 featured, like a second DVI, component and composite. Perhaps the one which is missed the most is the HDMI connection which is widely used for external DVD / Blu-ray players and games consoles. There is a connection also for the Dell Soundbar which is available separately. According to Dell's spec the screen uses 22W power during normal operation but our tests confirm at factory settings this is more like 26.6W. Once calibrated (see below) the power consumption is reduced a little to 23.3W. In standby the screen uses 1.3W which is only slight more than the advertised "<1W". Updated Feb 2011: The Dell U2211H utilises an LG.Display e-IPS panel (LM215WF2-SLB1), capable of producing 16.7 million colours using a 6-bit colour depth and Advanced Frame Rate Control (AFRC). Some modern e-IPS matrices are not true 8-bit panels (a cost saving initiative I expect) and this is one of them. Originally the panel was listed as true 8-bit based on the manufacturers spec, but studying detailed information from LG.Display's datasheet confirms the panel is in fact 6-bit+AFRC. This review has been updated accordingly in this section. An important thing to consider for most users is how a screen will perform out of the box and with some basic manual adjustments. Since most users won't have access to hardware colorimeter tools, it is important to understand how the screen is going to perform in terms of colour accuracy for the average user. I restored my graphics card to default settings and set it to its standard profile. The U2211H was tested at default factory settings using the DVI interface, and analysed using LaCie's Blue Eye Pro colorimeter and their accompanying software suite. Default settings of the screen were pretty pleasing really on the whole but I'll talk through each section. On the left we have a CIE diagram with triangles representing the colour space (gamut) displayed by the monitor. The black triangle represents the gamut of the screen itself, with an orange triangle being shown as a reference to the sRGB colour space. As you can see, the monitors colour space matches this very closely and is in keeping with other modern standard gamut displays. Below this you can see the result for gamma, which on average was 2.3, that being very close (4% deviation) from our target of 2.2 which is the default for computer monitors. Colour temperature was recorded at 5965k, being only 8% out from our target of 6500k, the temperature of daylight. Luminance was also a fairly modest 159 cd/m2 which was good since many displays can be set far too bright at default settings. This was not that far our from our target of 120 cd/m2, the recommended luminance for LCD monitors in normal lighting conditions. At a luminance of 159 cd/m2, we obtained a very impressive black depth of 0.16 cd/m2 which gave us an excellent static contrast ratio of 994:1. This was a very good result indeed. Default settings returned an average dE of 2.3 which offers you fairly accurate colours even out of the box and without calibration. In some cases, the dE ranges up to a maximum of 6.5 (blues), but overall the colours were fairly even. The screen did feel pretty comfortable to use even at the slightly elevated luminance. Colours appeared pretty even and vivid. This was a positive result for the U2211H as when you're buying a lower cost screen like this, you're probably unlikely to want to fork out for a hardware colorimeter for calibration. Even if you don't have one, you can expect some fairly decent performance from this model. A minor adjustment of the brightness control should help address the slightly high luminance as well. Gamma was now corrected to 2.2 and colour temperature was now <0.5% out at 6486k. Luminance was recorded at 121 cd/m2 at a brightness setting of 58% in the OSD menu. At this luminance, black depth was a very good 0.14 cd/m2, giving an excellent static contrast ratio of 864:1. Colour accuracy was also greatly improved, with average dE now only 0.3. With a maximum of only 0.5 dE LaCie would consider colour fidelity to be excellent. Testing the screen with colour gradients revealed smooth transitions across the range, with only very slight gradation in darker tones. I also calibrated the screen in the 'standard' preset mode. You cannot alter the individual RGB channels in this mode, so apart from the brightness/contrast setting, you have to rely purely on graphics card LUT adjustments. We saw the same thing with the Dell U2311H, but the standard mode here did not really allow for accurate correction of the colours being produced for some reason. Gamma, colour temperature and luminance were corrected as before in the 'custom' mode, but colour accuracy remained quite a long way out. Average dE was 1.2, ranging up to 3.9 maximum. I wouldn't recommend using this mode for obtaining the best colour accuracy, you will have better luck with the custom preset. I've plotted the results of these tests on the above graphs and in comparison with other models we have tested in this kind of size range. As you can see, out of the box the average dE is actually the joint best we have seen amongst these competing models at 2.3. 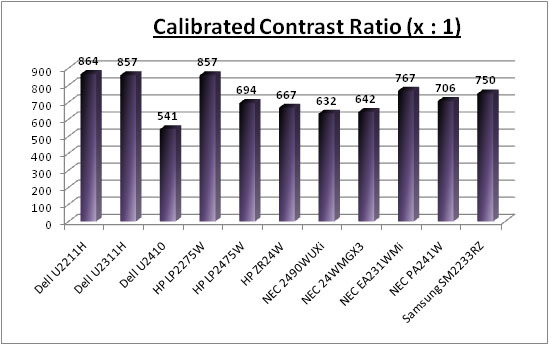 This is on par even with the NEC 2490WUXi, but keep in mind that the NEC is a professional grade monitor so there are other things to take into account when considering use in colour critical work. Nevertheless, the default colour accuracy of the U2211H was very good and should offer users some comfort that they have reasonably accurate colours, even without hardware calibration. This is important since I doubt many people who buy a lower cost screen like this will want to fork out for a colorimeter. Default accuracy was very close to the 23" U2311H (2.4) as well, showing these two new e-IPS models come with well set up colours out of the box. 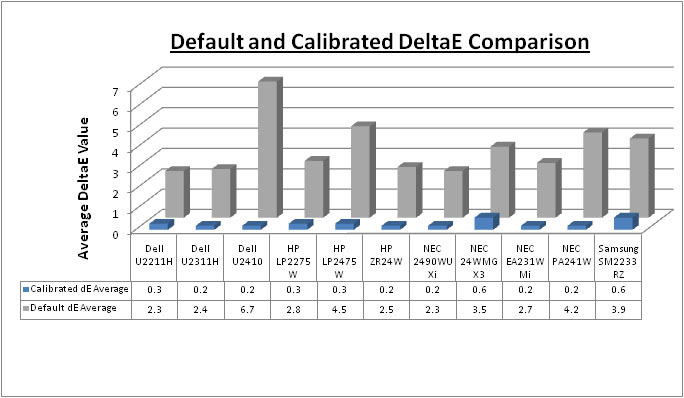 Some of the wide gamut models like the Dell U2410 (6.7) and HP LP2475W (4.5) are less accurate at default settings. 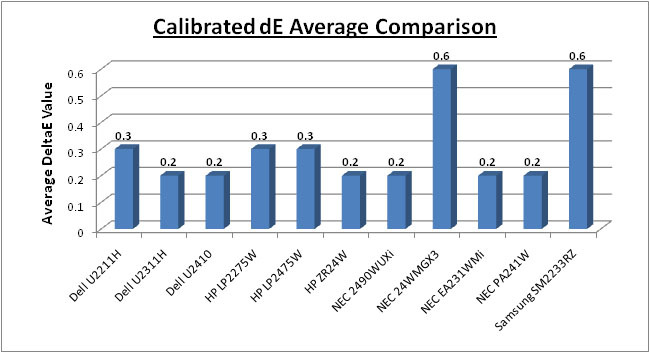 Once calibrated, the U2211H remains very close to the other models really at 0.3 dE average. It's ever so slightly behind the 23" U2311H (0.2) and 24" U2410 (0.2) but colour fidelity would still be considered excellent. 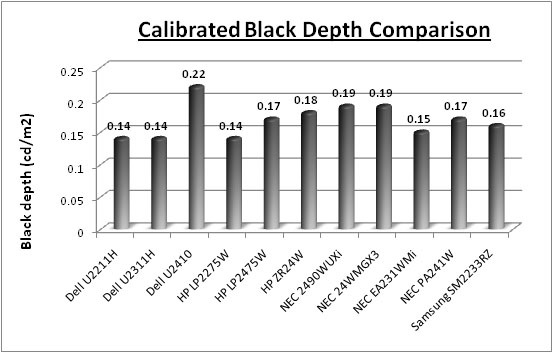 Plotting the calibrated black depth and contrast ratio results also shows an excellent performance and very comparable to the excellent results we saw from the U2311H. These two models offer some of the best blacks and contrast ratios that we have seen from any model in this range, rivalling even the S-PVA based HP LP2275W. Excellent performance from the U2211H here. These new 21.5" and 23" IPS panels have made some great improvements in black depth compared with older generation IPS matrices. The above results show that the contrast ratio remains fairly stable across the range at around 950:1 - 1000:1, but does ramp up a little at the lowest brightness settings. Luminance is 175 cd/m2 at maximum brightness control which is a fair way out from the advertised maximum brightness of 250 cd/m2. While most people will want to use a lower luminance anyway of around 120 cd/m2, it's worth noting that this screen is a little more limited if you want to use a brighter setting. At 0% brightness control, luminance drops down to a very low 23 cd/m2. A setting of around 50 - 60% should return you a comfortable luminance of around 120 cd/m2. Black point reduces as you lower the brightness control as you would hope. At 100% brightness this is 0.18 cd/m2, and ranges down to a very low 0.02 cd/m2 at 0%. This is a very low black point indeed, and at this setting the static contrast ratio is even 1153:1. 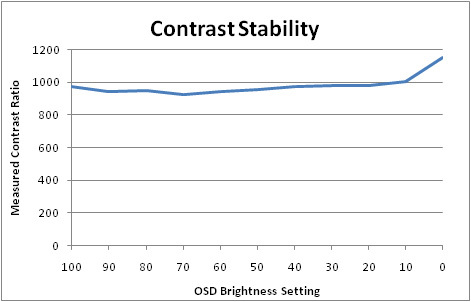 Contrast ratio is typically 950 - 1000 across the range of adjustments, but is a little higher between 20 - 0% brightness control. Overall the average contrast ratio is 979:1. 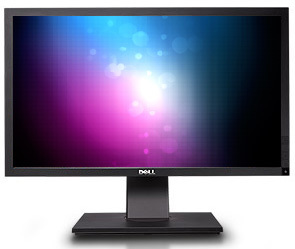 The Dell U2211H features a dynamic contrast ratio (DCR) control, which boasts a spec of 10,000:1. This is obviously a fairly big number even when you consider the great static contrast ratio we have observed. DCR requires the screen to be able to produce a very bright white, and a very dark black at the two ends of the control. 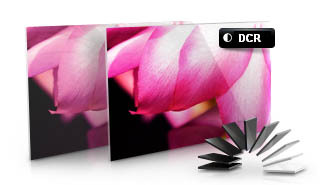 Dynamic contrast ratio involves controlling the backlight automatically, depending on the content shown on the screen. In bright images, the backlight is increased, and in darker images, it is descreased. For this test I would use the colorimeter to record the luminance and black depths at the two extremes. Max brightness would be recorded on an all white screen once the DCR has caught up. Black depth would be recorded on an all black screen. As you can see, the DCR didn't seem to do anything really! It's a shame because the contrast stability tests confirm the screen does have the necessary range to be able to get near to the advertised 10,000:1 DCR. The maximum luminance from the panel in that test was 175 cd/m2 when brightness control was at 100%, with a black point ranging down to a minimum of 0.02 cd/m2 when brightness is at 0%. If the U2211H was capable of controlling this range effectively through the dynamic contrast ratio control, it could reach up to ~8750:1 which would be a very good result. As it is, the feature didn't seem to do anything. We'd seen the same from the U2311H sadly, and other rather disfunctional DCR's from other models we have reviewed. Viewing angles of the U2211H were as you would expect from an IPS based panel. Horizontally there is a contrast shift from about 45° onwards. Vertically there is a slightly more pronounced darkening from above and below. It was very comparable to the U2311H, and given both use e-IPS panels I would say they are a little bit more restrictive than some H-IPS panels, but only slightly. The U2211H is certainly much better than TN Film matrices and is free from the restrictive vertical viewing angles and severe darkening you can see on models using this technololgy. It is also free from the off-centre contrast shift you can see from VA panels. No complaints in this test really. The uniformity of the screen was not too bad on the most part. The left hand edge of the screen was the only major area of difference, where luminance ranged down to around 98 - 99 cd/m2 (up to -22% deviance). This left hand edge was a bit darker than the rest of the screen, and the uniformity also seemed to exhibit this pattern as you reached towards the other edges, but to a slightly lesser extent. The screen was a bit darker (around minus 10 - 15% typically) along the bottom and top edges, and the right hand side. This was a fairly similar story to the U2311H but in that case, nearly all of the left hand half of the screen was affected, leaving a more obvious darker region. Viewing solid colour backgrounds including white and grey revealed some inconsistencies which were in keeping with these measurements. There was no obvious colour "tinting", but you could see slightly darker areas towards the left and right hand edges. As usual we also tested the screen with an all black image and in a darkened room. A camera was used to capture the result. There was some slight backlight leakage along the top edge, in two areas as you can pick out from the above image. The bottom left hand corner was also a little more widespread which was unfortunate. This leakage wasn't too severe, and not as bad as we have seen on some other models in the past, but it may prove distracting for some users. Normally I would rate a 20 - 22" sized screen down a little in terms of its use for office applications, but this would normally be down to its 'small' (by todays standards) 1680 x 1050 resolution. Thankfully in the case of the U2211H, the panel used offers a full 1920 x 1080 resolution. This is the same as many popular 23 - 24" screens and it's good to see a high resolution on a smaller screen. The pixel pitch is obviously a little smaller than the larger screens since you are squashing the full resolution into a smaller screen diagonal. However, at 0.247mm I still felt it was comfortable for prolonged office use without text being too small. I'd found the 0.233mm pixel pitch on the Dell U2711 (2560 x 1440 resolution / 27" screen size) to be a little too small for my personal preference, but the U2211H was not as severe. This 1080 resolution is suitable for some good side by side working which I think is always handy for office use. The luminance of the screen was also fairly modest, and you are easily able to adjust the brightness control to reach a comfortable luminance for varying lighting conditions. A brightness setting of 50 - 60% should give you a luminance of around 120 cd/m2, and you can get much lower should you desire, down to a very low 23 cd/m2. There's no preset mode for 'text' or 'internet' here, so you will need to calibrate one of your preset modes to a suitable luminance if you are using a lot of office applications. I personally think that ambient light sensors and dynamic backlighting control can be useful for office work, but there isn't one available here sadly. The screens ergonomics do afford you a decent range of adjustments, and the easy tilt, height and pivot functions should allow you to get a position you want. The rotate function might also be useful to some, and at this screen size I think it's a bit more practical than on the larger screens. The 2x USB 2.0 ports on the left hand edge are useful as well for connecting cameras, printers etc. A card reader might have been a nice added extra. The Dell U2211H was tested using the chase test in PixPerAn, a good bit of software for trying to quantify differences in real terms responsiveness between monitors. As a reminder, a series of pictures are taken on the highest shutter speed and compared. The images below show the best case example on the left hand side, and the worst case example on the right hand side. This should only be used as a rough guide to comparative responsiveness but is handy as a way of keeping a constant test of each screen. The Dell U2211H has a specified 8ms G2G response time indicating the use of Response Time Compensation (RTC) technology to boost grey to grey transitions. The panel used is LG.Display's 21.5" e-IPS matrix, the LM215WF2. As you can hopefully see from the above images, the U2211H offered fairly decent pixel responsiveness. In practice, the naked eye could detect some blurring of the moving car and a very slight ghost image if you looked closely. This was certainly less pronounced than our observations of some non-overdriven models like the NEC EA231WMi for instance. In the case of the NEC, the ghost image was more obvious due to the screens lack of any RTC impulse. The U2211H was a little slower than the U2311H and the blur was a little more obvious I felt. You can spot a slightly more noticeable coloured blur behind the moving car in the best case pictures. The RTC overshoot was much less of an issue though and there was no real sign of any white or dark trail. 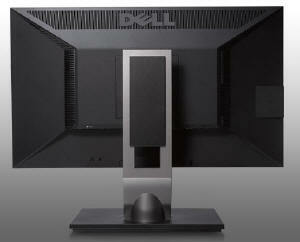 It looks to me like Dell have applied a slightly less aggressive RTC impulse on the 21.5" model than they did on the 23". The blurring is a little more noticeable, but the screen is free from the RTC overshoot we had seen on the larger version. I'd probably say they were on a par really overall when you consider these factors. I have also provided a comparison here between the Dell U2211H and our current champion in this test, the Samsung SM2233RZ. The super fast 3ms G2G rated TN Film panel of the Samsung, along with 120Hz panel technology, can offer some marked improvements in moving images. There's very little blurring and very few RTC artefacts. The 120Hz also serves to offer a higher frame rate where needed. 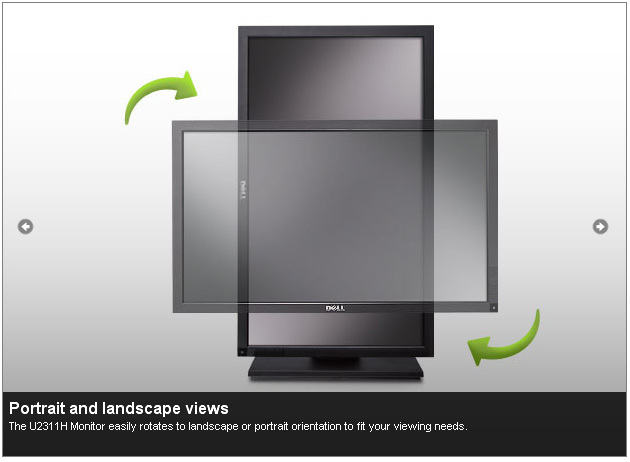 The screen features hardware level aspect ratio control available via the OSD menu. However there are only options for 'fill' or '4:3' which is a little strange. You would have hoped for an option to maintain the original source aspect ratio and perhaps a 1:1 pixel mapping mode as well. The U2311H offered the same options. The delay between the Dell U2211H and the CRT was quite minimal, with an average input lag of 15.6ms. This ranged up to 20ms maximum which was a good result. 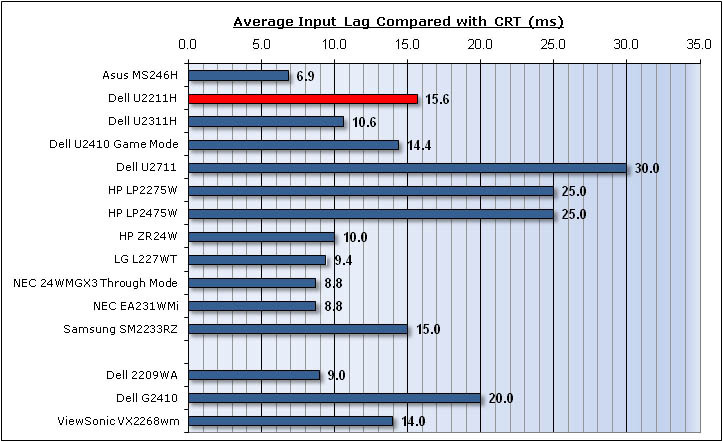 This did leave it a little behind the 23" U2311H model (10.6ms average) but pretty comparable to the 24" U2410 (14.4ms). This level of input lag is pretty low really, and shouldn't present any major problems for gamers I don't think. Dynamic contrast ratio is available but doesn't really work at all sadly. Our tests revealed the backlight and panel have the potential to reach high DCR if it were implemented properly. Good pixel responsiveness meaning fast moving images should be fine. Having only recently tested the 23" model, I had high hopes for the U2211H. Apart from the 1.5" size difference, there was very little to separate the two really. Colour accuracy, black depth and contrast ratio were all excellent, even out of the box which is important to consider in this price range. These were some of the best results we had seen in fact. Ergonomics and interface options were also very good considering the price range, and it was nice to see features like DisplayPort and the adjustments were not dropped to keep cost even lower. Pixel responsiveness and input lag were also good, so this really is a good all round performer. It was also good to see the full 1080 resolution available even though the screen was smaller, and the text size and pixel pitch were not a problem I don't think. The only slight issues really with the screen were the questionable uniformity of the backlight, being a little darker towards the sides of the screens. There was also some backlight leakage along the top and bottom edges which is something we had not seen from the larger 23" model. The dynamic contrast ratio didn't work at all, and it's getting a bit frustrating to see these features not working properly or as advertised. It was a shame in the case of the U2211H as well, since it should have been able to reach a very high figure had it worked properly. The U2311H retails for ~£265 GBP, while the U2211H is about £235 which is a great price for a screen with these features and an IPS panel. It should make a very good buy for anyone considering a screen at this size, but then maybe the extra £30 is worth it for the bigger U2311H. Dynamic contrast ratio didn't work!